Not a day goes by without another financial institution getting bailed out. Let's see, we have Countrywide Financial, German IKB and now the UK based Northern Rock. The message ofcourse has not been lost on Gold. When central bankers open their check books for all to come and borrow, to borrow with abandon, the message the market receives is clear. Nobody will be left to fail and central banks will print as much money as it takes to ensure this. Predictably, Gold will continue to rise as the bailouts stack up. Loose monetary policy is going to unleash devastating inflation and will further underpin the bull market in Gold. 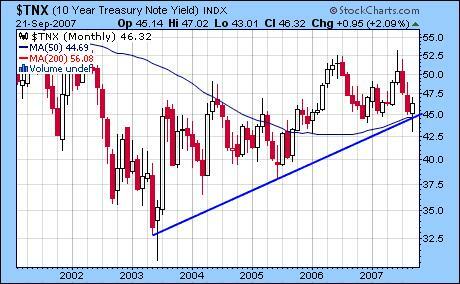 Bonds are challenging their 50 month moving average and long-term uptrend. Probabilities favour higher yields going forward. Talking about inflation, what better way to gauge Consumer Price inflation than by looking at food prices? 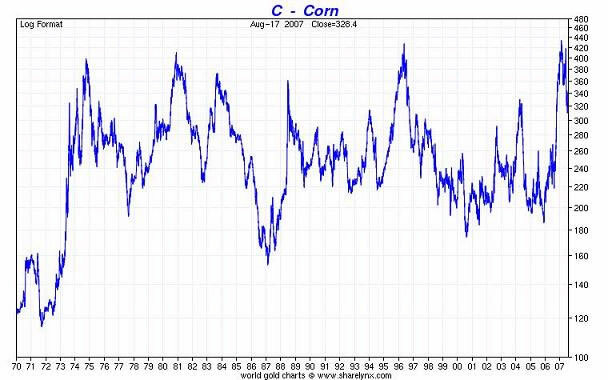 Just take a look at this chart of Corn going back to 1972! 400 – 420c has been incredibly strong resistance going back as far as 1973! With the continued strength in Current Oil Prices it seems likely that Corn will finally breakout of this consolidation and unleash a fire storm of price inflation. This will cause long-term rates sharply higher along with Gold as the safe haven investment of choice! I am an investor and newsletter writer specializing in Junior Mining and Energy Stocks.